Serving Princeton, Morristown, Wayne, Summit, Short Hills, Montclair, Tenafly Township, Somerset, Livingston, Paramus, Randolph, Edison and many more Northern New Jersey Communities. We also serve Southern New Jersey. 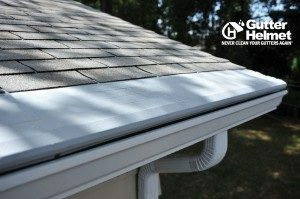 Get the Gutter Helmet® gutter guard system today and never clean your gutters again! 100% guaranteed! Clogged gutters can lead to roof, siding, landscape and foundation damage. When gutters clog in the fall then winter arrives, water from melting snow will freeze, allowing snow and ice to build up on the edge and eaves of your home. As the build up gets heavier, your gutters run the risk of being torn from the side of your home! With the Gutter Helmet® gutter guard system, your rain gutters remain free-flowing at all times – no more clogged gutters and no manual gutter cleaning. With over 65 million feet installed across the US, and a lifetime manufacturer warranty – strongest in the industry – Gutter Helmet® is the premier gutter protection solution on the market. Gutter Helmet®’s multi-patented design keeps Northern New Jersey rain gutters free flowing year round – even in the harshest of weather conditions. See what some of our many happy customers have to say. Read some gutter guard reviews. And learn how the Gutter Helmet® gutter guard system works. Then arrange for your free estimate. Gutter Helmet by Harry Helmet® is the official dealer and installer of the Gutter Helmet® gutter guard system. We have thousands of successful installations under our belt throughout the Mid-Atlantic, including northern and southern New Jersey. If you have any questions or wish to set up a free estimate by phone, contact us directly. You can also request a free estimate online! Serving Northern New Jersey communities, including Newark, Jersey City, Paterson, Elizabeth, Edison, Washington, Franklin, Parsippany-Troy Hills, Hackensack and many more.